Not Strength 2D from the RPG mechanics. I am referencing STR 2 from the miniatures game, which bears serious mechanical similarity to how shooting and damage works (and/or worked) in 40k and is a much smoother basis for transition. If a T3 model gets hit by a S3 weapon (typical military man being shot by a typical military rifle) in 40k they have a 50/50 chance of getting wounded. Ditto a T4 space marine being shot by an S4 weapon, which is the norm for orks and renegade marines. Then you throw in armor saves and you will probably survive any given hit in 40k. Then we move over to Star Wars. If a S2 model get's hit by a S5 weapon in SWMB, they do an opposed roll, assuming they both roll an average of 3.5, that's 5.5 vs. 8.5, that's a wound and almost an incapacitation. Average soldiers being shot by average guns injured an average of every time they get shot in Star Wars Miniatures Battles. Not so, in Warhammer 40k. If a S3 model gets hit by a normal military weapon, they will also normally be wounded. If a STR 4 model, such as a hero gets hit by a military blaster, they will also usually be wounded. To get to where you will probably survive a common battlefield blaster in Star Wars, you are talking about rare individuals such as a hero or wookie wearing armor, a heroic wookie, or be a zero-G assault armor. 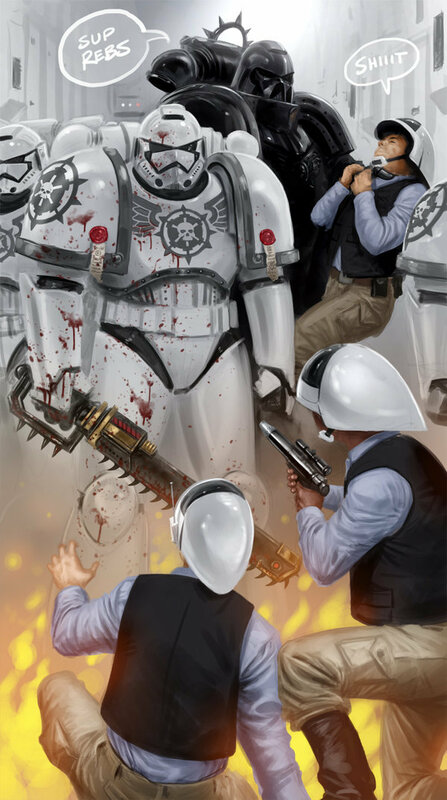 Since it's unlikely that Imperial Guardsmen are more bulletproof than rebel soldiers, it seems that the weapons in 40k are much less deadly than SW blasters. The to-hit mechanic in Star Wars Miniatures is so close to 40k's as to invite similar comparisons. Ordinary stormtroopers usually had a Blaster skill of 4(3), and needed a 3(4)+ to hit. So if they weren't armored they'd shoot as straight as space marines. Rebel troopers often did shoot as straight as space marines and therefore straighter than most 40k troops. That pic is truly awesome. Ok, now it's starting to get weird. Dear gawds, but those rebels are (still) f*cked. CRM, where did you find these pics? Because I want more of them. An article about Warhammer 40K / Disney crossover art came up on my FB feed. Some of it was cheesy, with Disney Princess heads sticking out of Space Marine armor, but these two were standouts. As CRM pointed out, rules crossovers are never a perfect fit. There are many "intangibles" that affect what a roll even represents conceptually. That is why I referenced the lore, rather than the rules. For example, according to 40k lore (and I quote... or rather paraphrase because I don't have the source in front of me): "there is fewer than one space marine for every planet in the imperium. Still, they are number enough for the task at hand." When the average space marine is the size of Chewbacca, you right there have a template for a higher minimum and maximum strength stat. And that's without factoring in the presence of not only redundant, but enhanced vital organs... or, more precisely, an enhanced, optimized-for-lifelong-warfare anatomy both internal and external, which includes superhuman musculature. And when we say life-long, we mean up to and possibly beyond 1000 years. According to 40k lore, the oldest living space marine is Sergeant Cleutan, at over 2000 years old, who mentored Dante, who himself is 1300 years old. Granted, the Blood Angels live longer than other space marines, but Logan Grimnar is 700, and Ulrick was already old when he selected Grimnar into the Space Wolves. The point being that space marine physiology is far more sophisticated than the biotech we see in SW, since a space marine apparently will not die unless his body (or soul) is destroyed. And, space marines do not get weaker with age (the most powerful ones tend often to be the oldest). As for star wars weaponry being more deadly than 40k weaponry, that's obviously open to debate, and your reasoning does make sense from a game to game comparison. However, as I said, in 40k, it is possible that an attack roll represents something different than the SW counterpart. For example, a heavy machine gun gets to make three attacks per turn in 40k, but this does not mean it is firing three literal rounds. You also mentioned that the SW game has more than one wound status, whereas 4p k does not. But you did not imply that such a rule indicates that SW humans are therefore tougher than 40k humans because you understand that its not an apples to apples comparison. In any case, I would say that nothing I have seen in SW comes anywhere close to being as martially adept (soldier for soldier) as a 40k space marine. An argument could be made, for example, that a royal guardsman (in SW) is the approximate equal to the imperial guard kasrkin, which are still overshadowed even by space marine scouts. Referencing my paraphrased quote earlier, an argument could also be made that a space marine's skills should be in the 10D+ range, since a space marine would have to scour multiple planets before finding his equal in terms of martial prowess. 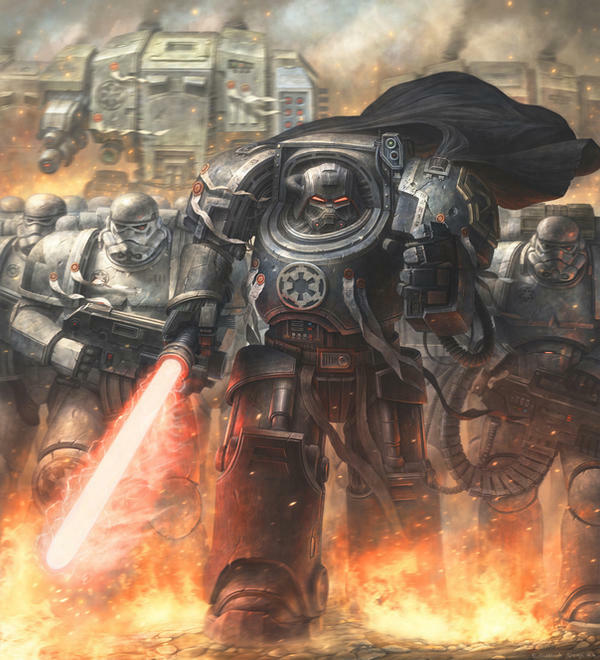 In any case, I feel like the space marine lore is not quite compatible with SW (one of the reasons being that I feel that genetically altering a 12-13 year old is vastly more complicated than altering a strand of DNA and then replicating it into a complete organism), but also, the particular warrior culture of the space marines just doesn't feel like it fits into Star Wars "history" anywhere. Characteristics are generated one at a time. For each, roll 2d10 and add the resulting numbers together. Then add a base number to the result to generate the final Characteristic. a space marine would have 2D10+30 for each attribute. the rest of space marines special abilities are based solely upon which cybernetic enhancements the individual has implanted. That system is designed to allow Space Marines to be used as player characters, so balancing is factored in. I'm looking more at using Space Marines as high-end opponents, not PCs, so balance isn't that high on my priority list.